This page is dedicated to users who need to repair polygon meshes with various sorts of defects and flaws. Below you can find a list of software tools that perform such tasks and are freely available on the Internet. Maintained by Marco Attene (CNR-IMATI, Genova), Marcel Campen and Leif Kobbelt (RWTH, Aachen). If you are aware of a tool that should be listed here, please do not hesitate to contact us. 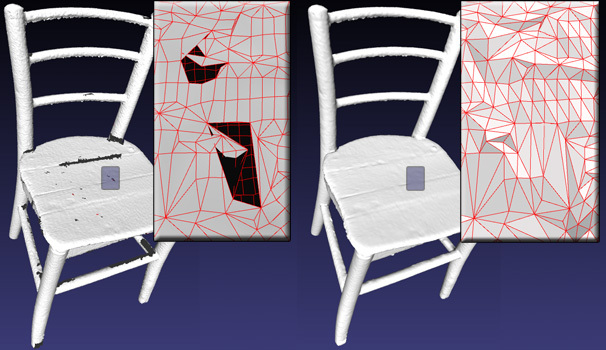 Slides of the tutorial "A Practical Guide to Polygon Mesh Repairing" held at Eurographics 2012. 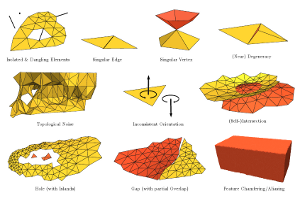 The tutorial is based on the survey Polygon Mesh Repairing: An Application Perspective by Marco Attene, Marcel Campen, Leif Kobbelt which was published in ACM Computing Surveys. 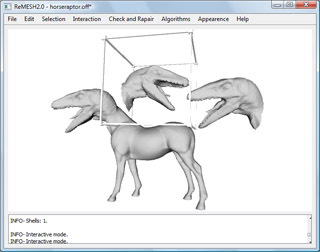 This software takes as input a polygon mesh and produces a copy of the input where all the occurrences of a specific set of "defects" are corrected. MeshFix has been designed to correct typical flaws present in RAW DIGITIZED mesh models, thus it might fail or produce coarse results if run on other sorts of input meshes (e.g. tessellated CAD models). When the software fails, it appends a textual description to the file "meshfix.log". 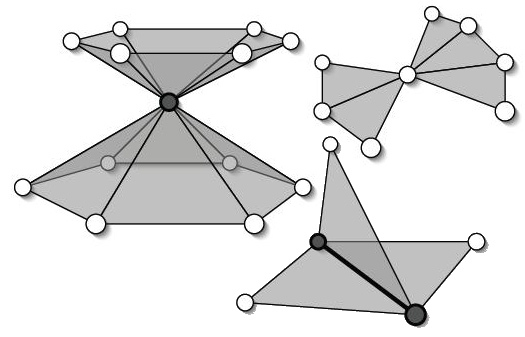 The input is assumed to represent a single CLOSED SOLID OBJECT, thus the output will be a SINGLE WATERTIGHT TRIANGLE MESH bounding a polyhedron. All the singularities, self-intersections and degenerate elements are removed from the input, while regions of the surface without defects are left unmodified. Accepted input formats are OFF, PLY and STL. Other formats are supported only partially. See http://jmeshlib.sourceforge.net for details on supported formats. PolyMender is based on the algorithm presented in Tao Ju's paper Robust Repair of Polygonal Models appeared in the Proceedings of SIGGRAPH 2004. The program reads in a polygonal model (i.e., a bag of polygons, or polygon soup) and produces a closed surface mesh that approximates the original model. PolyMender consumes a small amount of time and memory space, and can accurately reproduce the sharp features in the original geometry. PolyMender is suitable for repairing CAD models and gigantic polygonal models. 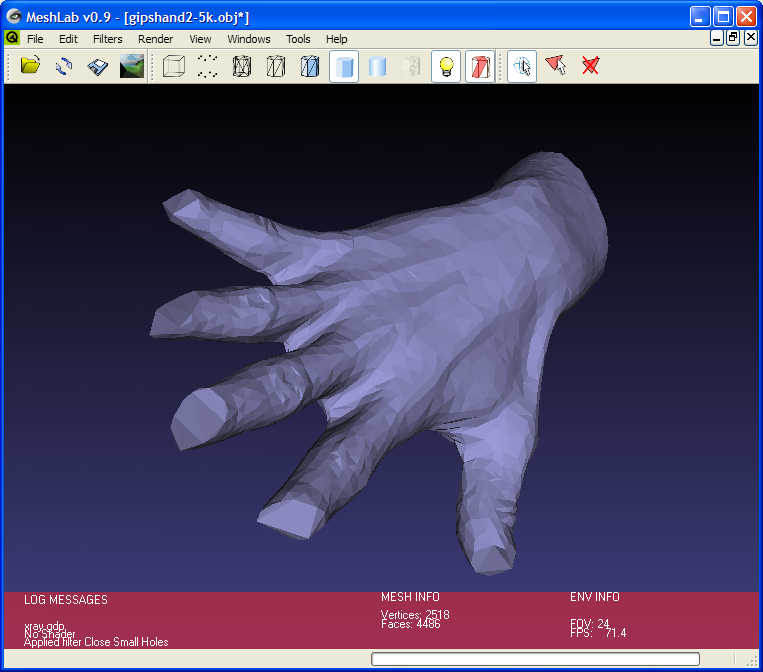 Alternatively, PolyMender can also be used to generate a signed volume from any polygonal models. ReMESH is a powerful editor for manifold triangle meshes with advanced repairing features. It has been developed to finely post-process polygon meshes coming from digitization sessions, but it can also be used to edit meshes produced differently. Most operations can be performed interactively through mouse-clicks on the mesh. Both low-level (edge-flip, vertex-insert, ...) and high-level (simplification, subdivision, ...) operations are supported. A rich and intuitive selection mechanism makes ReMESH extremely flexible and user-friendly. The software provides all the means to automatically filter out most of the typical flaws that models may have when coming from a 3D digitization session (degenerate triangles, isolated vertices, noise, topological artefacts, holes, ...). Although most of the repairing operations can be performed automatically, the user is allowed to retain a full control of the editing process. ReMESH implements cutting-edge technologies to process 3D geometry, and is one of the technological results produced by the EU-FP6 financed Network of Excellence AIM@SHAPE (http://www.aimatshape.net). by Marco Centin and Alberto Signoroni. Occasionally you find a triangle mesh, containing errors you would like to fix. With TriMM, the TriangleMesh Manipulator, you can repair, alter or convert triangle meshes stored as .OBJ, .OFF, .PLY or .STL files. You can also create some simple meshes. by ALICE, INRIA Nancy Grand-Est / Loria. 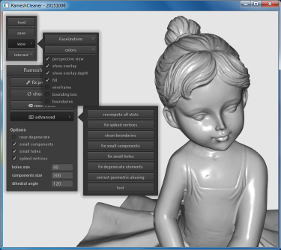 Graphite is a research platform for computer graphics, 3D modeling and numerical geometry. In the context of mesh repair, it contains functions to visualize holes and non-manifold configurations, to fill holes, to smooth and remesh surfaces, and also allows for low-level user interaction in the repair process. by Paolo Cignoni and other developers. 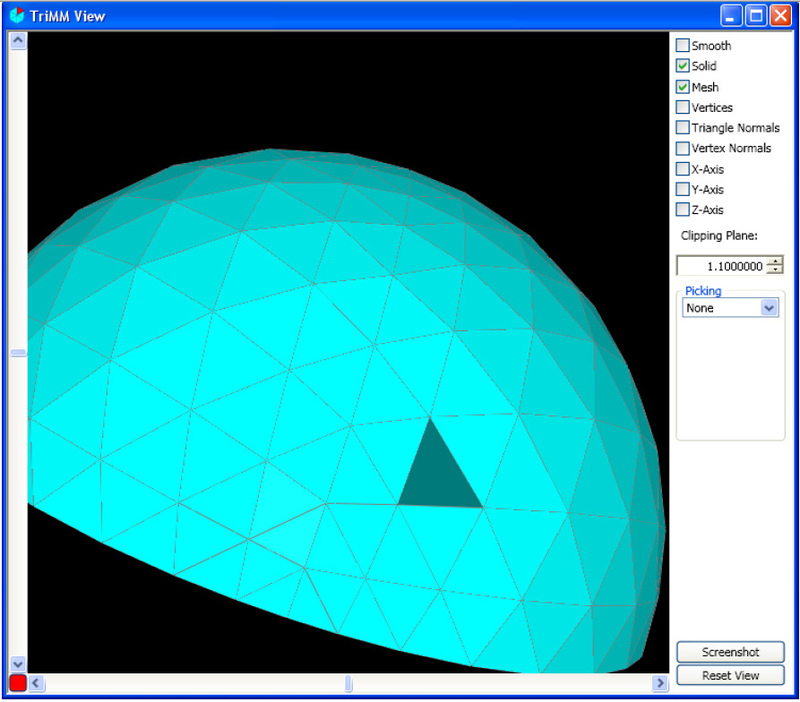 MeshLab is an open source, portable, and extensible system for the processing and editing of unstructured 3D triangular meshes. The system is aimed to help the processing of the typical not-so-small unstructured models arising in 3D scanning, providing a set of tools for editing, cleaning, healing, inspecting, rendering and converting this kind of meshes. Among its features, MeshLab includes the following set of repairing tools: removal of duplicated, unreferenced vertices and null faces; removal of small isolated components; coherent normal unification and flipping; erasing of non manifold faces; automatic filling of holes; feature preserving smoothing and fairing filters. by Jan Möbius and other developers. OpenFlipper is an OpenSource multi-platform application and programming framework designed for processing, modeling and rendering of geometric data. Additionally it provides a highly flexible interface for creating and testing own geometry processing algorithms. A powerful scripting language can be used to access all parts of OpenFlipper and modify geometry or the user interface at runtime. Some fundamental mesh cleaning and editing tools are already included. More sophisticated repair techniques are going to be integrated soon. Source Code complementary to the Course at SIGGRAPH 2007. Latest release: 2008. Among its various modules, this package provides source code implementing useful repairing algorithms such as Gueziec et al's cut-and-stitch for conversion to manifold (IEEE TVCG 2001), Liepa's algorithm to fill holes in meshes (Procs. 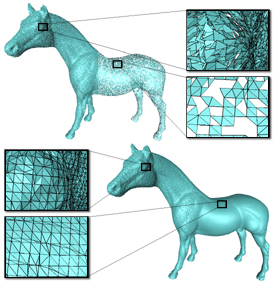 SGP 2003), Nooruddin and Turk's algorithm for simplification and repair of polygonal models using volumetric techniques (IEEE TVCG 2003), iterative Laplacian smoothing for noise removal, mesh fairing based on minimizing the surface thin-plate energy.